When I was a kid my mom and I lived in San Francisco for a year while she attended art school. 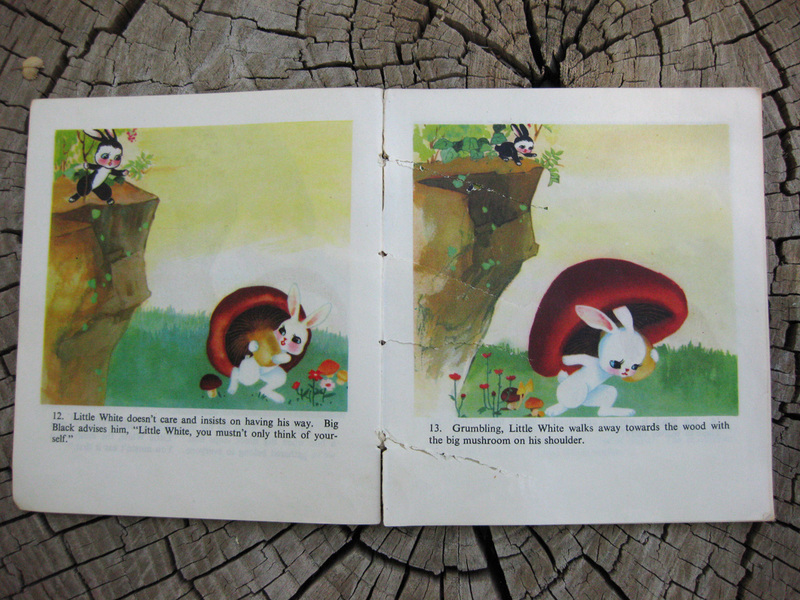 At some point during that year I acquired this book in Chinatown, which I loved for it's beautiful illustrations. It wasn't until I was in college and a friend's Chinese fiancé freaked out when I lent him this book, that I realized that it had a communist message. 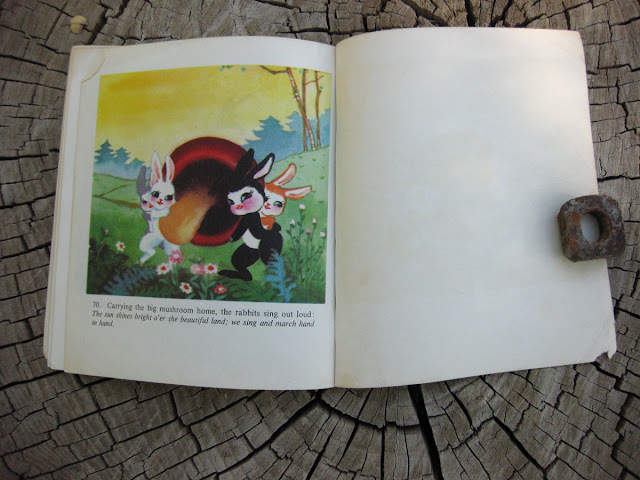 (He freaked out with excitement and nostalgia because he knew the book). Little white rabbit learns a valuable lesson about how selfishness is dangerous and everyone benefits from thinking of the greater good. Whatever, I still just like the pretty pictures. 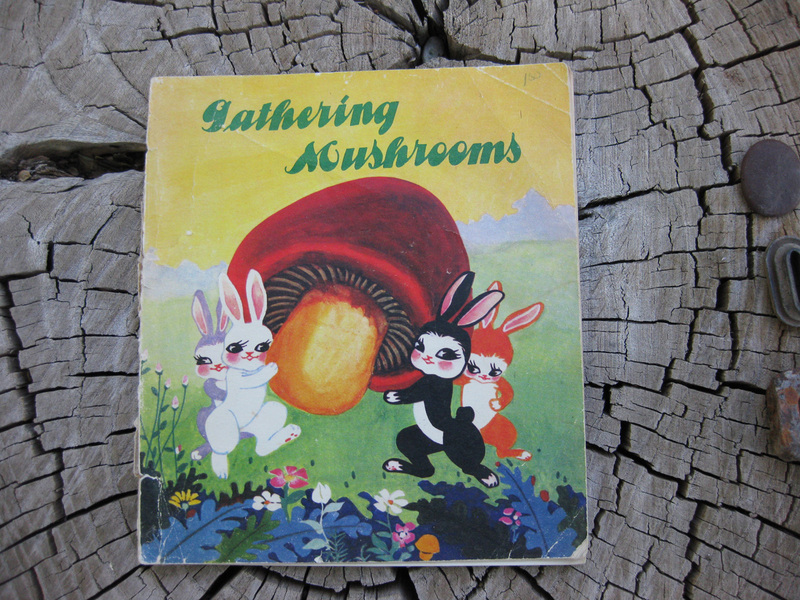 Gathering Mushrooms ©1977, Story and drawings by Tzu Chiang, Chiu Yi, and Ku Ping Foreign Languages Press, Peking. 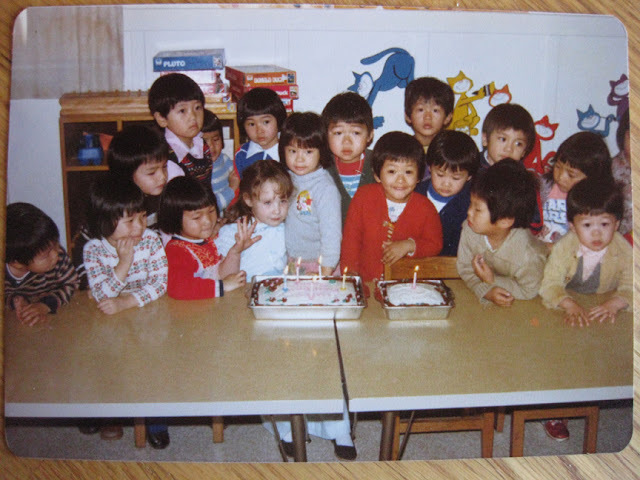 And just for a little more Friday fun, this is me turning five at Chinese kindergarten, San Francisco, 1979. Your old photos are a complete treasure trove. This one rocks! Remember my friend Erik? He would die to see this book - he collects all sorts of interesting relics like this to show to his history students. Of course, Erik and I had many fun conversations at your wedding. I'd offer to lend it to him, except the binding is not so healthy, and therefore I don't want to mail it anywhere. As for the photos, the ones from Christmas at the Chinese kindergarten are even better, but this illustrated the experience better. OMG i just had the same nostalic feeling. I grew up with those kind of books as well... and until now, i wasn't able to find the name of the books or the artists, i was very young and while other kids played with barbies or read disney related books i was reading exactly this, hahaha. I'm Colombian, and now i'm a Graphic Designer, i LOVE illustration and have been looking for this for a long time.